Naturally, I wanted to do something kind of special to commemorate my 250th course played. 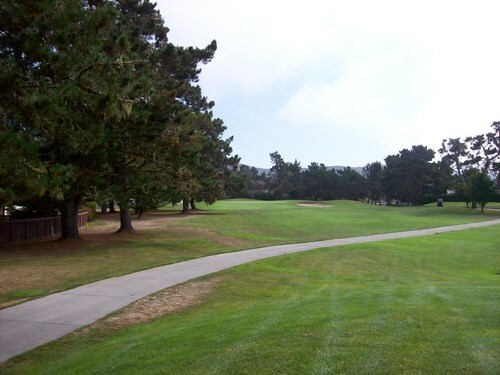 I had toyed with a number of options and was leaning toward Torrey Pines, but it seemed their conditions are sub-par right now and not quite worth the hefty fees they pay us non-residents. 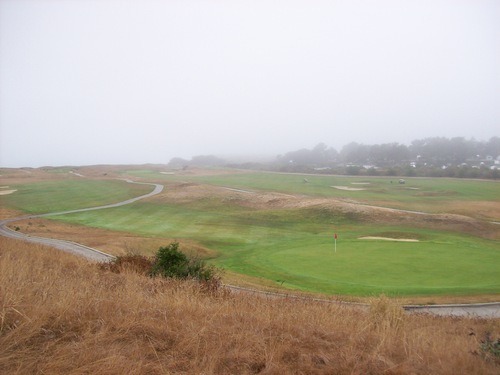 So with the Monarch Dunes GK Event this weekend anyway, I just decided to extend my trip and play some nice courses further up along the coast. 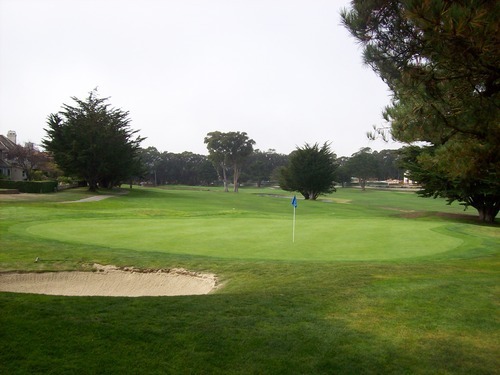 Of course, I looked to the Monterey area since there are still a number of courses around there I have yet to play. 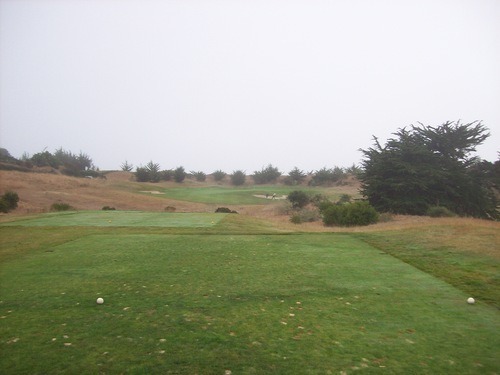 Another place a little further up the coast that always intrigued me was Half Moon Bay Golf Links, but their regular prices are steep and it would mean adding even more to my drive. However, I saw that they have an e-club on their website and it claimed there were good deals sent out regularly. So a couple weeks ago, I signed up on their site and a few days a later I got an email. 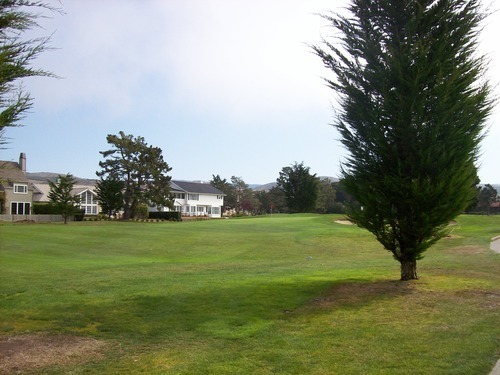 The normal rack rate at Half Moon Bay on a Thursday would have been $160, but the e-club rate was $79! So as soon as I got that email, my mind was made up. 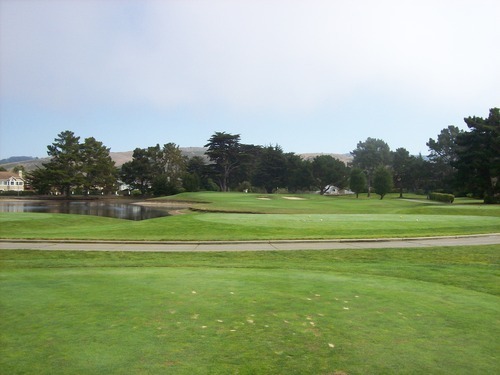 Half Moon Bay Golf Links would be numbers 250 and 251. After all, they do have two courses there! I hit the road last night after work and drove up much of the way. 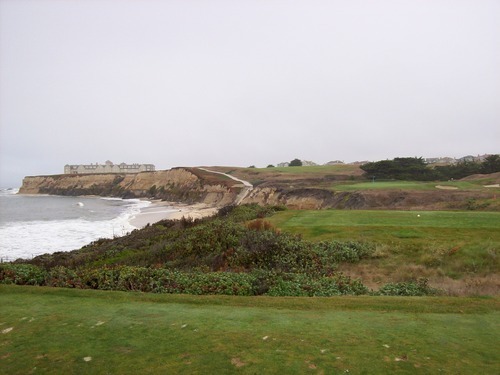 I hit the road again early this morning to get up to Half Moon Bay in time for my 7:30 tee time on the Ocean Course. I got there with ample time to spare, but that is the earliest they let anyone out. I was paired with another single and we were first off, which was nice. We enjoyed a nice relaxed pace even though it was very foggy out there this morning. 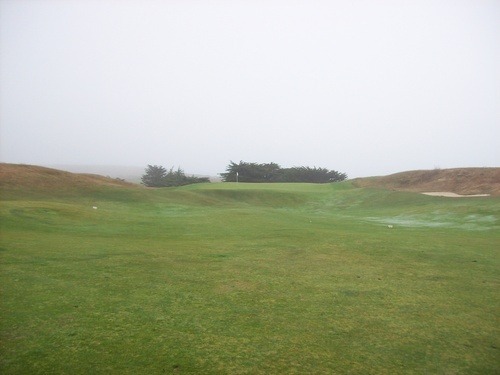 Ocean is the newer of the two courses, designed by Arthur Hills in 1997. 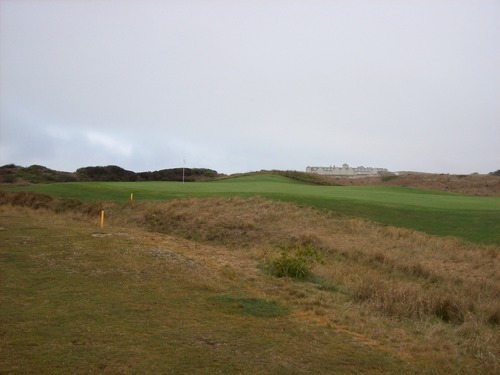 It is a seaside links course in the style of Bandon Dunes, though not quite as dynamic a design as any of those courses. 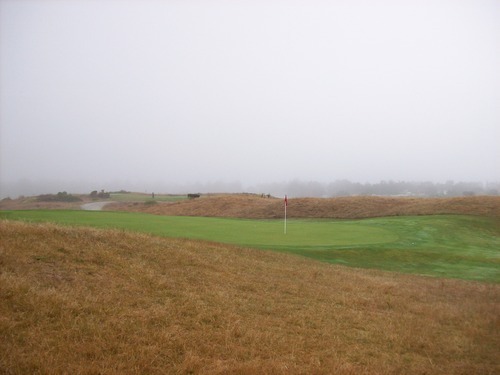 All the expected features are there—wide, undulating fairways, big, undulating greens, well-placed bunkers (and many of them) and holes framed by deep, golden fescue rough. So it definitely fits the bill as a nice seaside links design, but it just didn’t blow me away like some others have in the past. 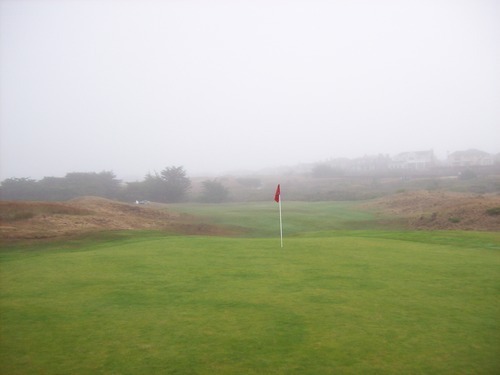 There are supposed to be a number of great ocean views as the course meanders along the dunes and bluffs, but we couldn’t see too much with the fog. 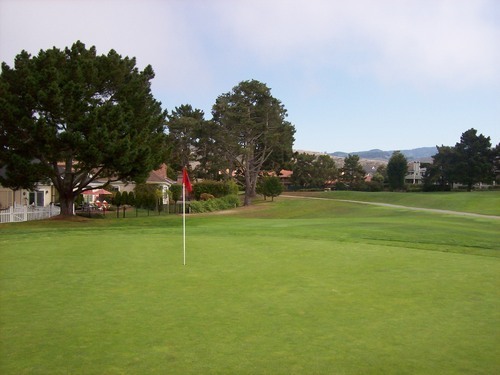 In fact, we had a hard time just figuring out where we were supposed to be hitting our balls on a few holes, let alone enjoying any spectacular views. 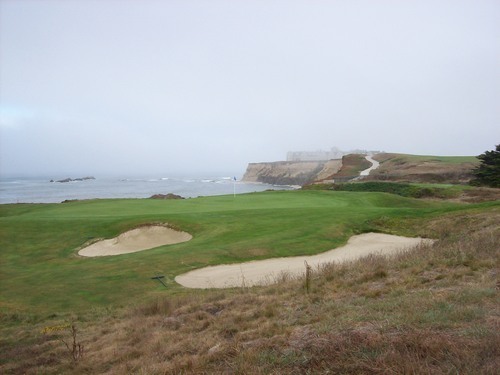 However, when we did reach the most beautiful hole here (the par-3 17th), the fog let up just long enough for us to get some nice views and pictures. Otherwise, good pictures were unfortunately few and far between with such low visibility. 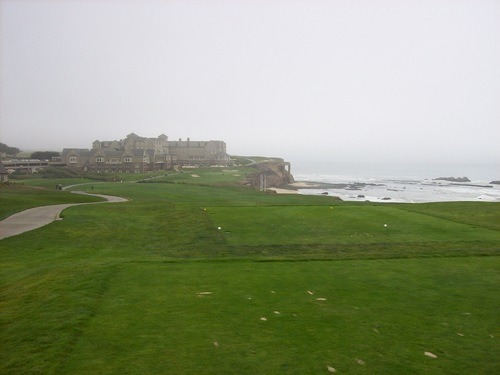 I was a little underwhelmed by the Ocean Course. Part of that was definitely due to the weather, but the conditions weren’t as nice as I would have hoped. Overall, it was decent. 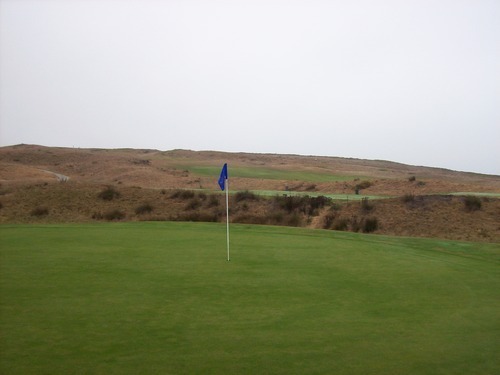 The fairways and greens were super firm and fast, which is appropriate for an old school links style course. The fairway turf was a bit spotty and so was the rough. There were a lot of bare areas and clumpy bits of grass, so good lies weren’t always found. I was in a number of sand traps (and by “a number,” I mean way too many) and the sand was downright excellent. If the weather was nicer and views weren’t so obscured, I probably would have enjoyed this course more, but it kind of put a damper on the round (literally and figuratively). After I finished my morning round, I checked back in with the pro shop. Originally, they had set me up with a 1:00 tee time on The Old Course, but they knew I wanted to get back out as quickly as possible. Turns out the course was pretty open, so I was able to go right back out (after grabbing a quick hot dog and Powerade at the snack shack first—a $10 hot dog and Powerade by the way). They charged me a discounted replay rate for the second round, and it was only $69. So all told, both rounds together cost me less than one rack rate round would have had I not signed up on their e-club. I scarfed down my dog and headed right over to the first tee by myself. The first few holes were great as I was cruising along. Then I caught up to a twosome and I could tell they were backed up behind some other groups. Another single eventually caught up with me and joined me for awhile, but he stopped playing after 10 holes and I was left by myself again on the back nine. 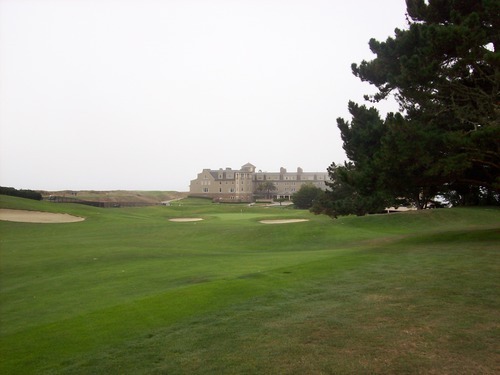 Whether you are talking about the weather, the conditions or the overall golf experience, the differences between The Old Course and The Ocean Course were like night and day. It was such a different round. 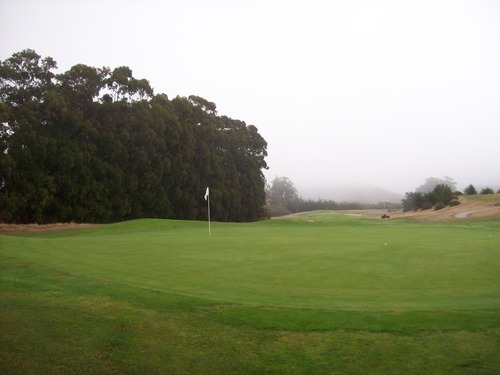 Though it was still overcast and a little foggy throughout my second round, it was was much clearer and resulted in much better pictures. 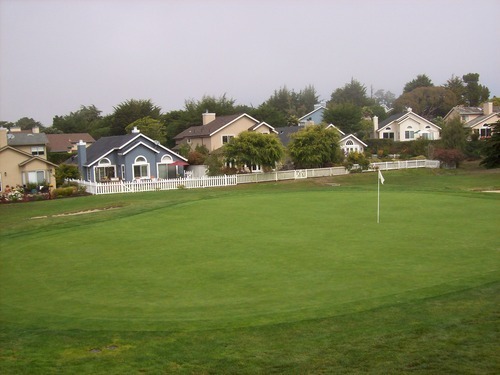 The course is also completely different as it winds throughout residential areas and features a more “traditional” kind of layout that’s more consistent with what you’ll find at other Bay Area courses. 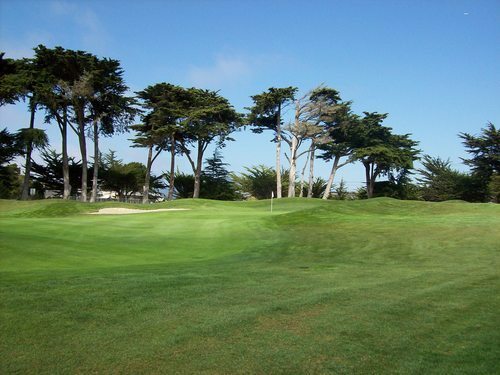 Plenty of trees and dogleg hole layouts that put a premium on accuracy. 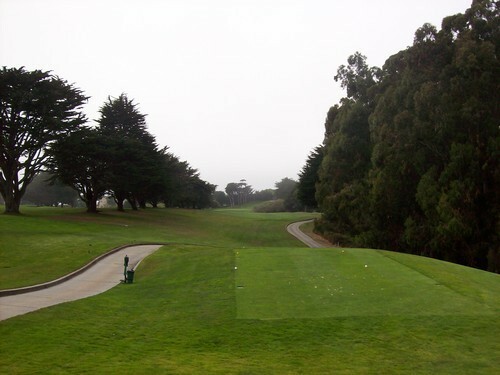 This course was designed by Arnold Palmer, and it is apparently the second course he ever designed (back in the 1970s). The layout was much more enjoyable than I expected and the conditions were very nice, as well. 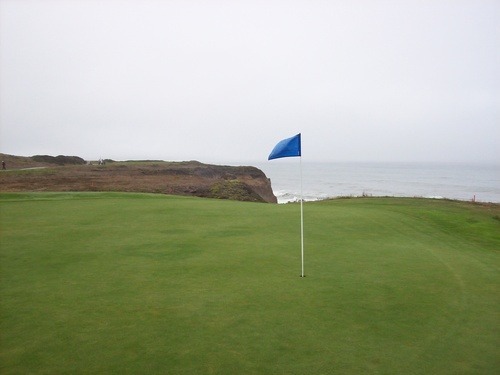 This course was much more lush and green than Ocean and it played completely differently with longer cuts throughout. The fairways were nice and fluffy (though the grass here is extra “sticky”), and the rough was deep and punishing. The greens were a bit softer than on Ocean, but still quite fast. 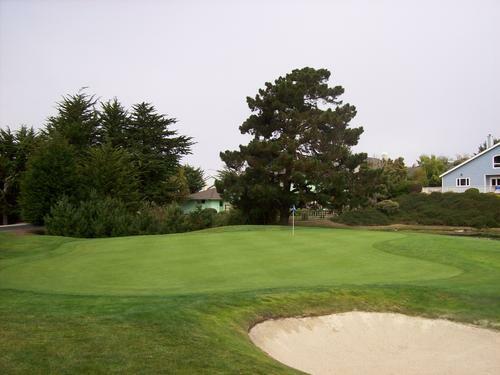 The greens aren’t quite as undulating on this course, but still offer plenty of challenge for your short game. 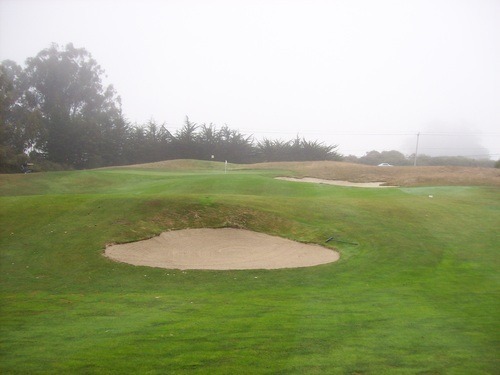 I was also in quite a few sand traps here and they were equally excellent. Some of the nicest sand I’ve played in some time. 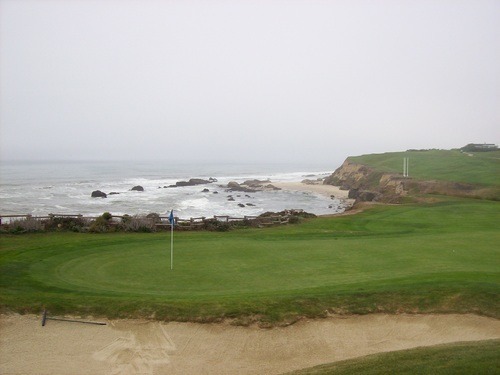 The layout takes a drastic turn as you near the finish and reach the signature seaside holes. 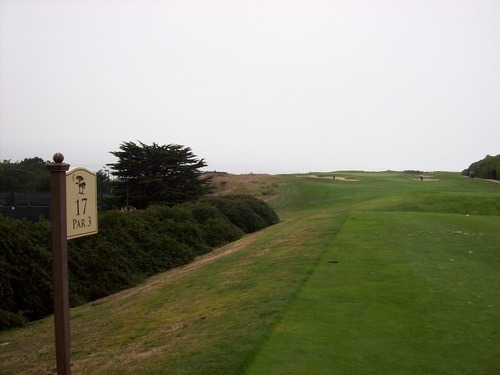 The 17th is a simple par-3 with the ocean in the distance behind the hole. 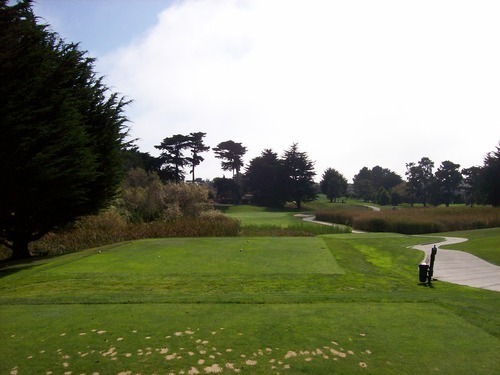 It’s kind of reminiscent of the 17th at Pebble Beach, though it really doesn’t have that much in common design-wise. It just gave me a similar vibe. 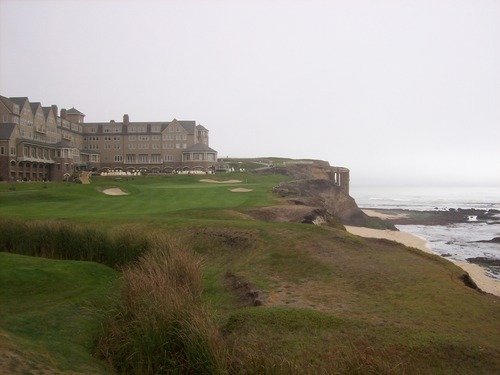 Then, you get to the 18th, which is easily one of the most incredible finishing holes I’ve ever played. 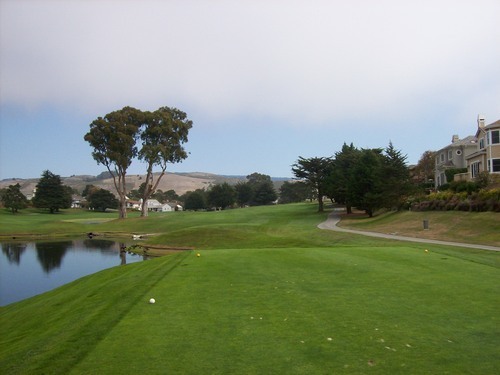 It is simply beautiful with beautiful views of the waterfront all along the hole. The tee is elevated and you get a great view of the entire hole with the Ritz-Carlton hotel framing it from behind. Rugged ocean cliffs run along the entire right side and it looks amazing. It’s a challenging hole, as well. 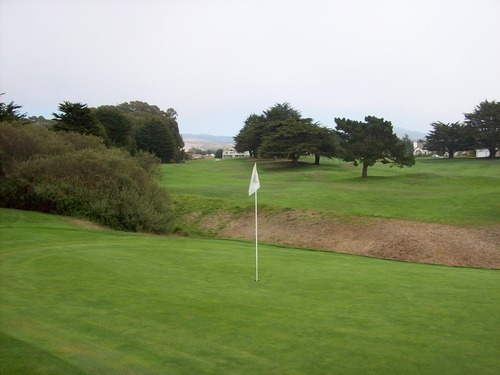 The fairway is pretty wide open (as long as you don’t spray it too far right and onto the beach), but the second shot is over a small ravine to an elevated green that is skinny and features some severe undulation. 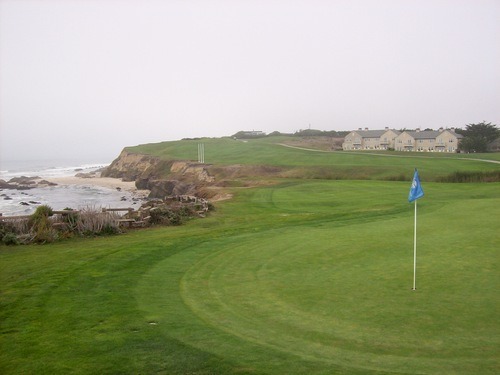 What a great way to finish a round and finish my day at Half Moon Bay. 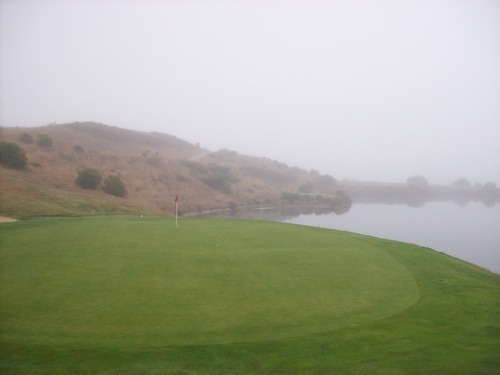 Even though the fog caused a little unpleasantness in the early round, the second round more than made up for it. 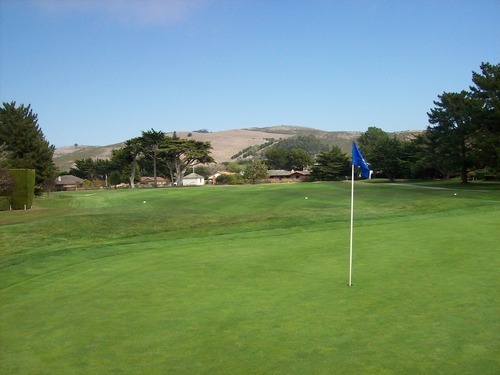 In the end, I walked away with a pleasant impression of the courses, especially considering the good deal I got for a 36-hole day at a premier resort. 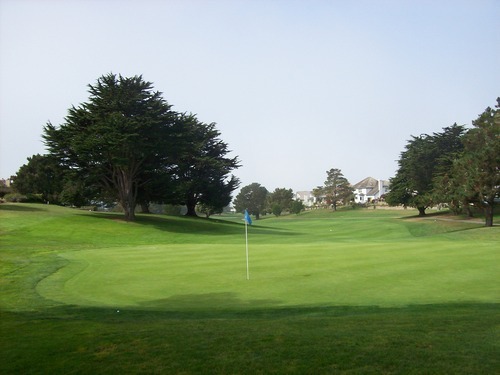 Tonight I am staying in Monterey and will be playing around here tomorrow, so stay tuned for more Golf Nomad adventures as I continue to work my way down the beautiful California coast.